In Accessibility, Browsers, Current Events, Design, Engineering, Events, Front End Engineering, Life..., Talks, Travel, Yahoo! 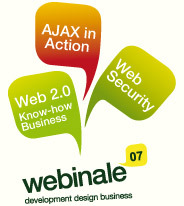 I’m scheduled to present two sessions at the upcoming Webinale conference in Singapore on April 23rd and 24th. More details soon, but wanted to give you advance notice. I wanted to let you know that I’ll be speaking at @media again this year, this time at the Hong Kong event. There are only a few days left for discounted registrations, so sign up quick. All the details here on the @media 2007 Asia site. In Design, Events, Front End Engineering, References, Talks, Travel, Yahoo! Phil Palmieri, Chad Cole, and the Refresh Orlando team put on a great web conference this month in Orlando, Florida, called Refresh06. I presented two talks, “Creating Accessible DHTML” and “The Yahoo! User Interface (YUI) Library”. Descriptions and download links for both talks are below. The Internet’s dramatic shift from static to dynamic sites presents a series of new challenges to those committed to and dependent upon accessibility. I really enjoyed myself at this conference because it reminded me how lucky we are to have such a passionate and dedicated community in our profession. In my experience, the web design and web development communities are earnest, passionate, and collaborative. (btw, cookies to the person who identifies the origin of that triplet phrase.) Given a choice, I’d always rather surround myself with people who love what they do. It’s fun learning, it’s fun sharing what we learn, and it’s fun bonding over common struggles. I appreciated all the conversations at this conference. Because it was a relatively small event – about 65 people I guess – we all got lots of quality time. The big group dinners of 40 and 50 people were good, as were the 10-top lunch outing and obligatory pub duty. Here are just a few of the people I wanted to give a thank-you shout-out too (with apologies to the many I’m fogetting right now: Cyndi and Brian Fling from Blue Flavor in Seattle. Bruce Cooke, Varick , Joey and all the cool guys at nGenWorks, and Varick in particular for the great sketch (above) and permission to use it. Cindy Li, the Design Rabbit herself. 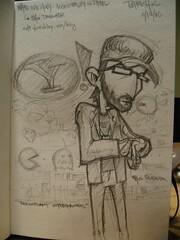 Mike Girouard, aka Mike G, had a nice style full of passion for the web (he teaches at Full Sail, among other things). Janet Lynn Ford came down from Minnesota (midwest represent! ), and we had a great talk about the ongoing stuggle for Accessibility. She and I have definitely been through some of the same things. Dave Hime and Rhodes Gibson were great contacts to meet. Their company, go9media does good work with an Accessibility focus – I look forward to working with them in the future. Jared Smith and I have some nice talks – though not as much as I’d have liked. He posted his User-center, Standards-driven Web Accessibility presentation on the WebAIM site. Faruk Ates, Jeremy Keith, Paul Boag, Andy Budd, Cameron Moll (great chat – happy for your plans! ), Jina Bolton, Garret Dimon, Dan Rubin, Jason Garber. Last but not least, I was very happy to finally meet Stephen Anderson in person. Sharp guy, and his talk on the last day was one of the very top highlights for me. For more about the conference, try a technorati search for “refresh06″, the event page on Upcoming.org, and the flickr tag for “refresh06″ sorted by interestingness.